World Vision is committed to partnering with the people of Mozambique to improve their lives today and to help deliver sustainable solutions for the future of their children, families and communities. Please pray for our work with the poorest children in Mozambique. Danilo (pictured, second from left) is 10 years old and lives with his mother and two younger sisters, Hilaria, 7, and Marta, 5. They live in a small house that belongs to a friend. Some years ago Danilo’s father passed away. Since then, life has become a struggle. They do not have enough money to buy food, repair their home or buy clothes. Danilo’s mum, Isaquinha, shares "It's not easy to wake up and not know what the kids will eat. Since my husband died I have not been able to work on my own land because I'm always working for others in exchange for food to feed my children." This has forced Danilo to look for work and help earn some money to buy food. He shares “I do anything and everything for people to make ends meet. I help people to carry rice to the market, wash dishes or do some cleaning. In exchange I ask for money or a cup of rice to take home." Since his dad died, Danino’s mum has developed mental health problems. He fears for his mum, "She often wakes up in the night screaming and crying for help. When you approach her, she says that she is crying for God’s help. Sometimes she won’t do anything for a week, she just whispers or cries." Despite all these struggles, Danilo has big dreams of becoming a teacher and he works hard so that he can finish his education. He only has one exercise book for all subjects. He is happy and grateful that someone cares enough to pray for them. "Please pray for God to help us. We are alone and I want to study and become a teacher to have a steady job to help my sisters and also teach children here in the community". Please pray for Danilo that God will give him strength and wisdom as he supports his family. 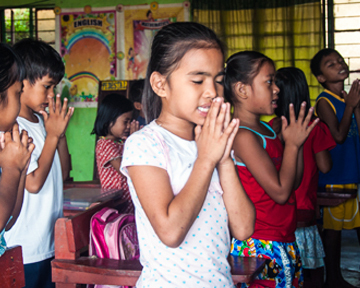 Pray that he will be able to reach his dream of becoming a teacher. Pray for God’s provision so that his family can have enough food and a safe home. Pray for Danilo’s mum’s mental health, that God will surround her with peace and healing. Janet, a 16-year-old girl is sick and suffering from several illnesses, including diarrhea, coughing and muscle and stomach pains. She has been attending the hospital and is on medication but she hasn’t got better. She lives with her 65-year-old grandmother, Luzinha, her brothers, Bostone and Zondane, and her sister, Luiza. Janet’s parents passed away and her grandmother is the sole provider for the family. She is a subsistence farmer, which she does on a very small piece of land. She does not harvest enough for the family so she also does some casual work on other people’s farms earn enough to provide school materials for Luiza, who is in grade 3, and Bostone, who is in grade 7. The family usually has one meal a day but there are days when they go without a single meal. 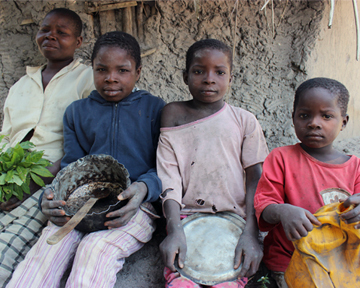 Sometimes their meals consists of porridge made from baobab fruits. Please pray for Janet’s complete recovery and for her grandmother to be able to produce and harvest enough food. Please pray for the protection of this vulnerable family.